Welcome to the Pioneer Association of the State of Washington! The Pioneer Association of the State of Washington and its predecessor organizations, the Society of Washington Territory Pioneers (established in King County circa 1871) and the Washington Pioneer Association (founded in 1883 in Olympia), included many of the earliest settlers in the state of Washington. 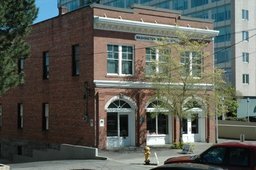 The two organizations merged in 1886 and filed articles of incorporation as the Pioneer Association of the State of Washington on December 5, 1895. 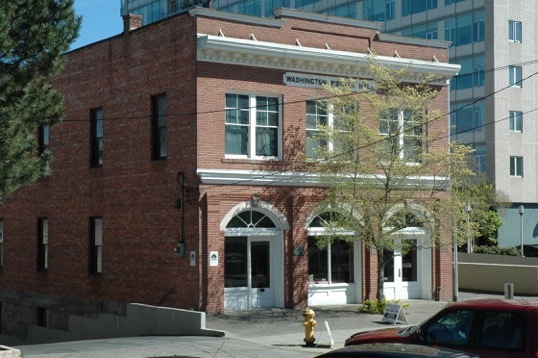 This makes the Association the oldest historical incorporation of Washington State. Current members of the Association have provided evidence of their ancestry back to those pioneers who arrived in the region prior to statehood, November 11, 1889. Pioneer Hall, shown in the photo above, is a depository and museum for historical memorabilia, photographs, books and other records primarily from the Washington Territory and early statehood period. It was constructed to provide a meeting place for the pioneers and their descendants and made possible by generous donations made by three of Seattle’s earliest settlers --- Judge John J. McGilvra and his wife Elizabeth (Hills) McGilvra donated the land, and Sarah Loretta Denny left a $20,000 bequest for the construction of the building. The building was dedicated on June 7, 1910, as part of the proceedings of the Annual Meeting of the Association. Speakers at the event included the builder, Mr. Gust Eckloff, former Civil War General, J. B. Metcalfe, Professor Edmond S. Meany, the Honorable Thomas Burke, Mr. E. F. Blaine, and the Association President, Thomas W. Prosch. A willow tree on the shore of Lake Washington, east of Pioneer Hall is from clippings that were brought to Seattle from George Washington’s tomb at Mt. Vernon, where willow cuttings had originally been brought from Napoleon’s tomb on St. Helena in the south Atlantic. 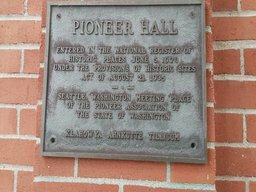 Pioneer Hall is also home for the Daughters of the Pioneers, Seattle Chapter, #1, the Fiske Genealogical Library and Colonial Dames of the State of Washington. We welcome visitors during regularly scheduled Open Houses; see the Events Page for details. Also, private tours are possible; see the Contact Page. Contributing towards our cause of preserving Pioneer Hall and it's contents. Opportunities to add your family's history to the Asociation's permanant archive. Expanding our repository of family membership applications dating back to the 1880s. Access to resources from four library collections, including the Fiske Genealogical Library. Receipt of our quarterly Newsletter, Pioneer Presences, as well as an online archive of past editions. Voluntary exchange of information among members through the Surname Research function on this site. Browsing the Gallery Page on this site to view over 160 digital images of portraits displayed inside Pioneer Hall.